It is turning to be more personal fleeing from the professional confrontations and conflicts over the past one week. It all started off when the bunch of theatre owners from Chengalpattu zones decided not to screen ‘Theri’ in their theatres alleging against the distribution – SPI Cinemas for demanding MG percentage from special shows. 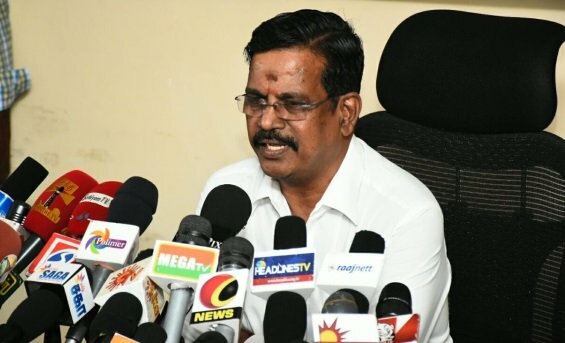 Although, there have been many justifications made on both sides, Kalaipuli S Thanu had addressed media channels this afternoon saying that the reason behind this drama was nothing but a personal issue. Before few months, the exhibitors association head – Panneer Selvam son had his marriage. He had then invited Superstar Rajnikanth and Vijay as special guests, which wasn’t possible on the spur of moment as both of them were shooting their respective films in abroad. Keeping this in mind, he has now created this problem. I am really disappointed that the innocent theatres owners have become the ultimate victims due to his vicious play of personal issues. While theatre owners are so much elated across different parts of the country and overseas that the collections are getting so much and the Chengalpattu is bounded to such terrible scenario. Also, he reinstated his stand that he never had a say regarding the negotiations that went on between the distributors and respective theatre owners. Moreover the ace producer was furious about the disappointing actions of a particular theatre owner who he claims has been in the habit of demanding money from him to bear the loss of a previous film, every time a new film was set for release in Chengalpet. Thanu also presented details of a bank DD drawn in favour of the above mentioned Mumbai based company for 2 Crores. This he did so to compensate for the loss the company might have suffered due to the film not being sold in Chengalpet. Apart from this, the producer revealed details about the worldwide box office collections of Theri and quoted it as a movie which has brought the exhibitors the earnings of two ordinary films put together.